Do you really want to hurt me? You can by not choosing to do business with my organisation. Of all the elements that make up a world class service offering (the product, the price, etc) one stands alone as the single biggest factor in defining with whom one chooses to do business...the service. Do you really want to make me cry? You will if you have the right product, price point and people and fail to adopt a service culture. This talk will examine some of the factors working against the creation of a culture and suggest some of the answers. 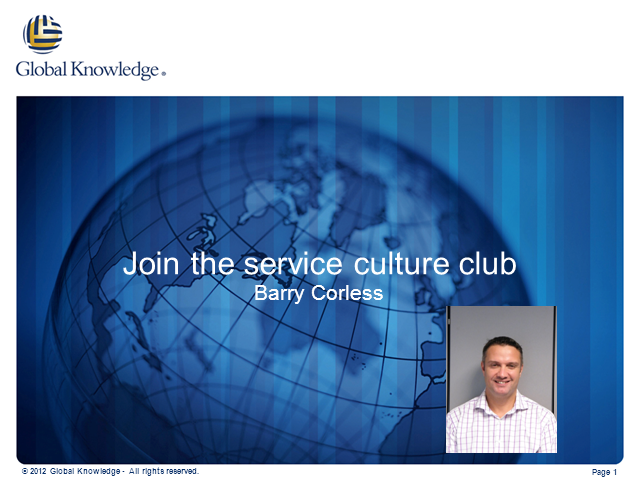 As well as an obvious thing for 80s music, Barry has over 20 years IT industry experience in public sector, retail and IT service provider roles. He has been managing and delivering service management education and consultancy solutions since 1999. In addition to his role within Global Knowledge, he is currently ex-Chair of itSMF (UK), former ITIL version 2 Chief Examiner for the APM Group, a current ITIL senior examiner and a Fellow in the PrISM Institute.